Do you know someone with a personal pickup truck, construction business, or a plowing company, and are unsure what gift to give them? 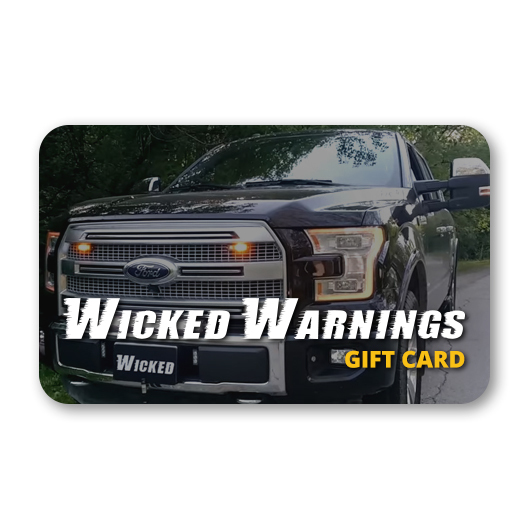 Give the gift of safety with a Wicked Warnings gift card! Our all-new gift cards can be used to purchase any item in our online store, or for an in-person installation service! Wicked Warnings can complete nearly any installation project, from safety strobe lights to Atomic LED cab lights and more! If the recipient of this gift card wishes to use the amount on an installation service, ensure that they email our team at info@wickedwarnings.com to schedule a consultation. Purchasing a Wicked Warnings gift card is easy. Simply select the amount you wish to give, and receive your virtual gift card via email or send it right to the recipient! If the amount you wish to give is not available in the options, please email our team at info@wickedwarnings.com, and we can help you purchase a custom gift card amount. To redeem gift cards in our online store, please enter in the custom card code (available in the email) at checkout. For more information, learn more about Wicked Warnings and our mission here.